Today’s student is Lisa from Burnley. 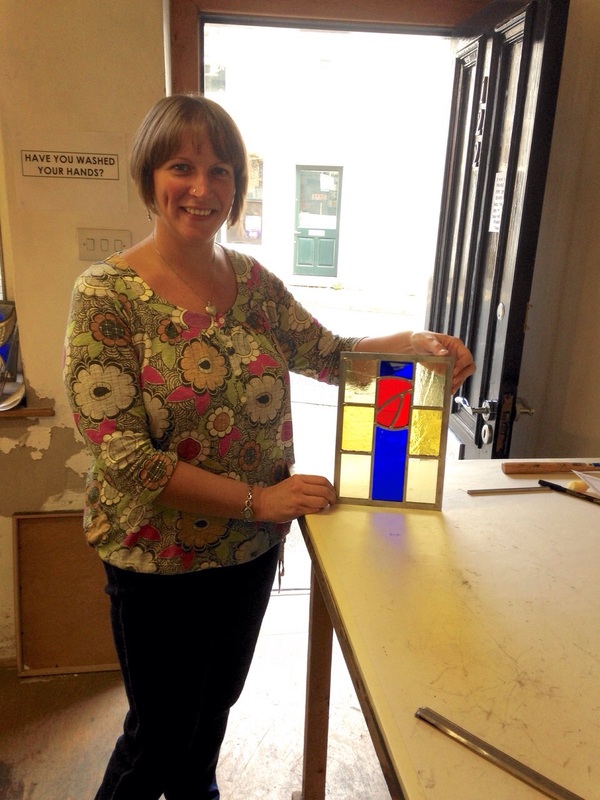 Lisa works for the NHS and has no previous experience or knowledge of the craft of stained glass. We start the day with a brew and a chat about the studio and some of the projects we have recently been involved in, as well as interesting jobs we have worked on in the past. I give a briefing on health and safety and a breakdown of the day ahead. Many of our students, like Lisa, have very little experience of working in a practical craft way, or producing beautiful things with their hands. So we begin at the beginning with glass cutting. I tell Lisa about the tools we use. I explain how to hold the glass cutter, how to use it with a straight edge, what to avoid when deciding how to cut a shape out of a piece of glass. At this point it is important to remember to number or put a mark on the piece you want to keep. Hopefully that way it won’t end up in the bin! After practicing on float glass we move on to textured glasses and have a go at marking out on the rough side and cutting on the smooth side. Another good reason for marking the piece you want to keep, as it can become very confusing very quickly once you start turning your piece over and cutting the edges off. I make another brew and enjoy a biscuit while Lisa continues to practice cutting. Next we have a look at a simple pattern and I explain how we draw one up, what the lines represent and how we use them. Patterns are more complex than they appear on first sight – did you know every line has 2 sides? This is because it represents the heart of the lead that sits between all the pieces of glass and holds the window together once it is built and soldered up. We have a selection of patterns drawn up especially for course days. Lisa chooses a Mackintosh inspired design which features a rose. As we take a look through the hundreds of types of glasses that we have to choose from, I ask Lisa to try to imagine what her finished piece will look like. No matter how many times the patterns are reproduced, they always look different; as each student picks an individual selection of colours and textures. Lisa selection is a mix of antique, textured, mouth blown and machine made glasses in red, blue and yellow. We break for lunch and have a quick look up town as we grab something to eat. It’s the Ribble Valley Mod Weekend and we see lots of mods in cool clothes with gleaming scooters. The next hour and a half is spent cutting the pieces to fit the pattern. This can be challenging and it is alway’s good to make friends with our electric grinder at this point! We simplified the pattern slightly so that it was achievable in the time we had and soon enough it was time to move onto leading up. Lisa had a go at stretching a length of lead and learnt to handle it carefully as it is very pliable. The trick to cutting lead is to remember to wiggle; it’s all in the wrist! Once we’d leaded up I introduced Lisa to the art of soldering – we could probably run a course on this alone. As we were using ¼” lead means you only have small solders, so I showed Lisa how to solder one side and she had a go at doing the other. Most people doubt that they will end the day with something they are proud of. But it’s our job and our pleasure to ensure that everyone who participates in our One Day Course for Beginners does. The smile on Lisa’s face says it all; another successful student and a very enjoyable day for us both. For more information please take a look at the Course Page in the drop down menu under Services above.